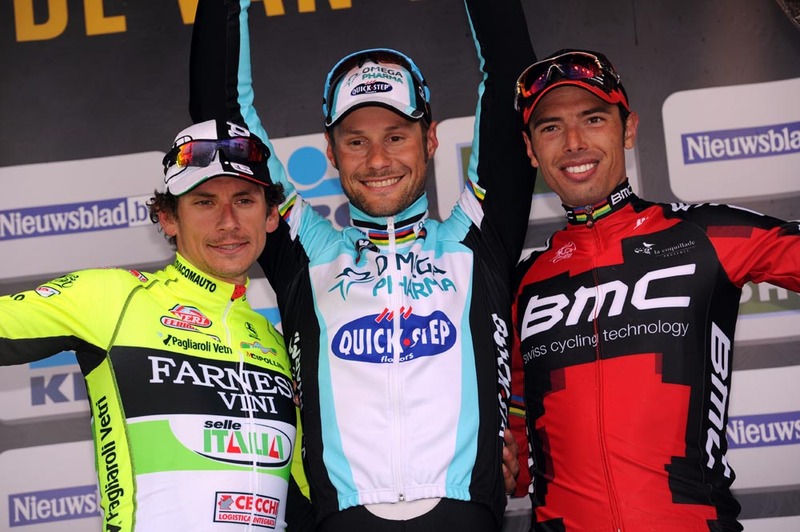 Tom Boonen (Omega Pharma-QuickStep) has continued his comeback to top form, convincingly winning the 2012 Tour of Flanders from a three-man escape group. 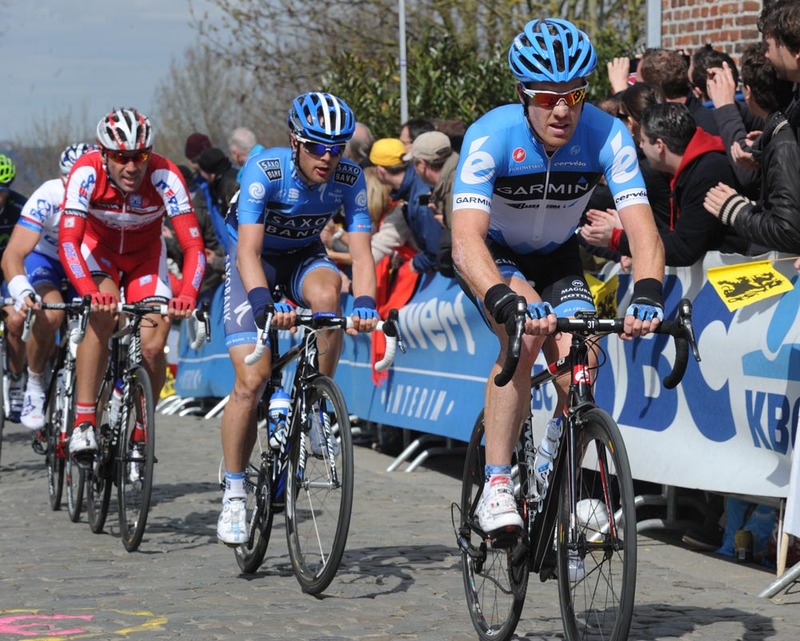 Boonen, Alessandro Ballan (BMC) and Filippo Pozzato (Farnese Vini) had forged a gap over the chasers after Ballan attacked on the third and final ascent of Oude Kwaremont. Pozzato and Boonen bridged up, and the trio worked well together to keep up the momentum. The leaders hit the final ascent of the Paterberg – the last of the 256km race’s 16 key climbs – and further distanced the chasers with 13km to ride. Boonen looked to be losing touch with his two breakaway companions, but quickly regained contact just after the crest of the punishing final climb. Peter Sagan (Liquigas-Cannondale) was the only rider in the chase group who looked like he could match the lead trio’s pace up the cobbles, but soon faded back. In the final three kilometres, Boonen, Ballan and Pozzato all slowed, reluctant to give any of their rivals a lead-out to the line. Ballan attempted to break free, but was soon chased down and dropped back from the effort. In the finale, it was a straight-up sprint between Boonen and Pozzato, with the Belgian taking another home win to great roars from the crowd. Greg Van Avermaet (BMC Racing) brought home the bunch for fourth place at 38 seconds, with Sagan in fifth. Boonen adds this Tour of Flanders win to his 2012 classics victories at E3 Harelbeke and Ghent-Wevelgem. Boonen has previously won Flanders in 2006 and 2005, and is now only the fourth rider to have ever won the race on three occasions. Fabian Cancellara’s hopes of taking the win were dashed due to a crash in the feed zone. The Swiss rider’s RadioShack-Nissan team-mates stopped to tow their leader back up to the action, but Cancellara stayed on the floor, his race over.